The last time I shared a Fall Sheet Cake recipe was 3 years ago and included pumpkin of course and it was a huge hit. That Caramel Cider Pumpkin Sheet Cake is a family favorite. However, after bringing home some delightful apples from our Michigan trip last month, the Apple wheels were spinning and with the moistness that apples bring, I knew it would be a cake of some sort. You know what had me even more stoked over this recipe is that it was even 10 times better the next day. I highly suggest making it the day before and as you know, a Sheet Cake makes a lot but it still didn’t last long in our house. The great news if you would happen to have some left, is that it freezes well. Let's be honest with why I am such a fan of the sheet cake. 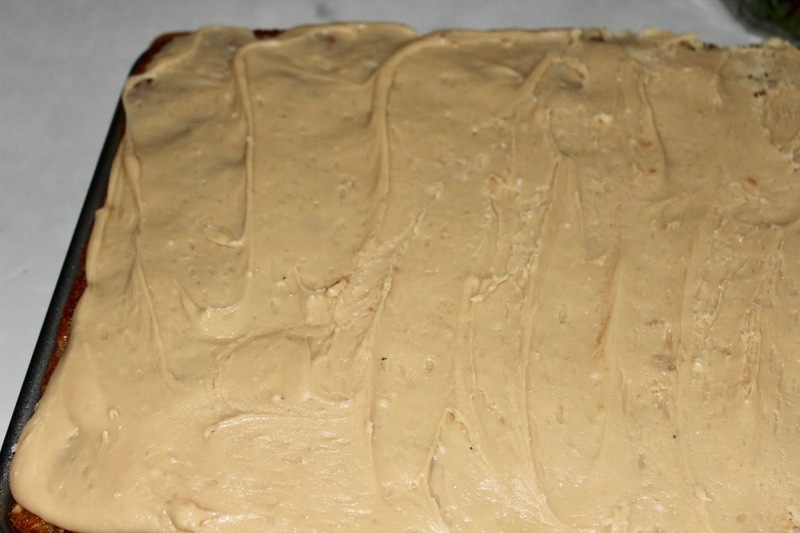 Since it is not as thick of a cake, say in a 13x9 pan, it allows for a much better cake/frosting ration. 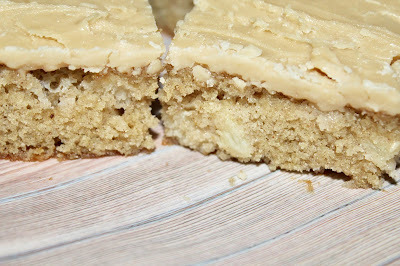 The thinner the car, the more frosting and in this case; the salted caramel, has me over the frosting moon! Preheat the oven to 350°. Grease a 11x17 sheet or jelly roll pan. In a medium bowl combine the flour, baking powder, baking soda, salt, cinnamon, nutmeg and cloves and set aside. In a large bowl with a mixer, mix together the butter and sugar. Add the eggs one at a time, when all eggs have been added, mix in the vanilla and the milk. Stir in the apples. Gradually add the flour mixture and mix until just moistened. Spread batter evenly into pan and bake for 20-25 minutes until toothpick inserted in the middle of the cake comes out clean. Cool cake completely. To make frosting; In a medium saucepan, place butter brown sugar and heavy cream and melt over medium heat just until boils, remove from heat and whisk in sea salt until melts, then mix in vanilla and powdered sugar with mixer. Add more powdered sugar after 3 cups if not desired thickness. Working quickly, as it will harden, spread over cooled apple cake. Cool and cut into squares. Would you believe I have never made a sheet cake? I love the idea that the larger area makes a better cake/icing ratio! Pinning this now. Have a terrific Tuesday! Holy cow, I am just realizing that your caramel cider pumpkin sheet cake is the same recipe I have! Someone must have given it to me after seeing it on your website - I had no idea where it came from! I would have been giving you all the credit - I've been making it for 3 years and had no idea where it came from!!! I should have known because you always have the very best recipes my friend. My goodness I owe you such an apology. My family loves that recipe and we'd rather have it then pumpkin pie at Thanksgiving. I'll have to try this one! 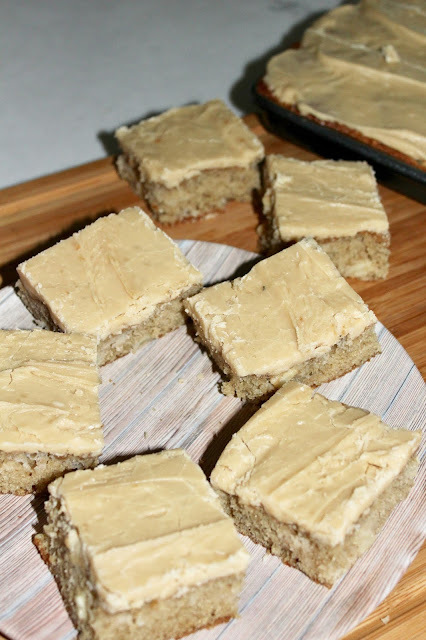 I am not going to lie, you had me at caramel frosting!! YUM! Yum! You had me at salted caramel! This sounds so good and is the perfect fall treat! Nothing beats a sheet cake! I love all things caramel! Thanks for the recipe. I need this cake in my life. That cake looks delicious! Yum! I can understand why it's better the next day. I've found this with pumpkin bread and other types of baked goods with spices like nutmeg and cloves. Somehow the flavors seem to develop better overnight! My mouth is literally watering!! I know what I am bringing to Thanksgiving! Yum, yum, yum! This looks absolutely delicious. You know I love a good cake and a nice helping of frosting... and all things apple, so now you have me hungry! Omg, these just look DIVINE! Pinning immediately! These look perfect for fall! I have extra applesauce that we need to use. Do you think you could sub applesauce vs. apples? Mmmm you had me at caramel frosting. I LOVE caramel. This sounds so delicious and perfect for fall. Pinning this now! Omg these sound delightful and SO perfect for fall! Thanks for sharing the recipe, Andrea! OH MY GOODNESS - this looks os good! What amazing fall flavors! 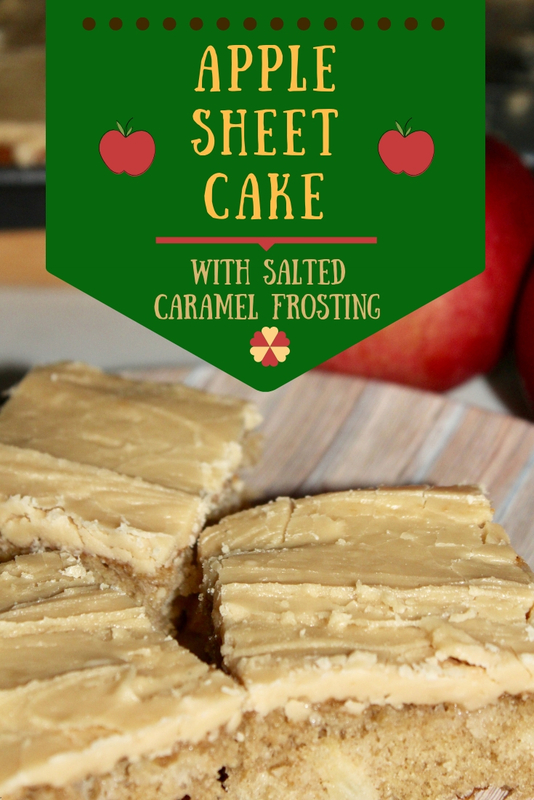 I usually shy away from apple desserts preferring chocolate, but with the cake (as opposed to a pie - not my thing) and salted caramel frosting, I am all in! Pinned! 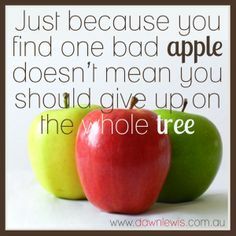 My mom always made apple cake when I was growing up. I haven't had it in years. Hope you had a wonderful day (and didn't blow away with that crazy wind- if it as windy in Indiana - as it is here)! You are killing it with these Fall recipes, Andrea! Really!! I wish I could just make every single on of them and stuff myself silly! Ha!!! This is right up my alley! 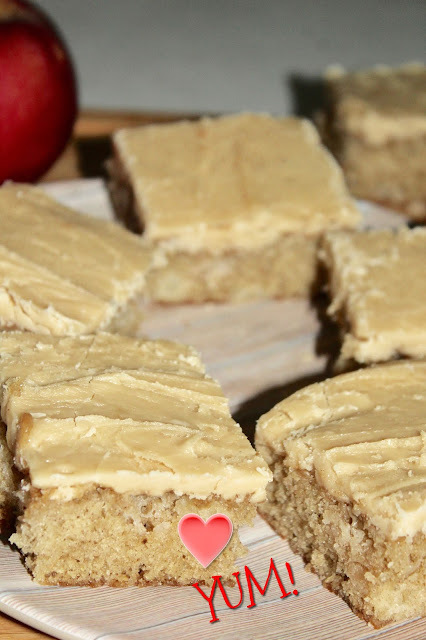 That frosting sounds so good and the cake must be healthy, it's got apples! Am I right?!!! Your recipes always look and sound amazing! This sounds wonderful! 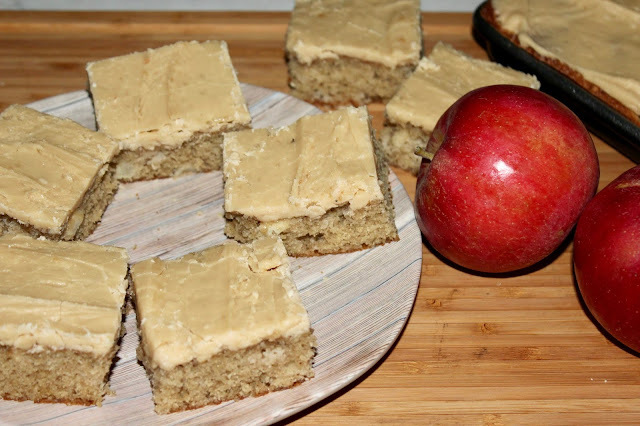 I have a half a bushel of fresh apples just to bake with so this is a must try. thanks for the recipe! Salted caramel frosting?! YES PLEASE! My mouth is watering!! This sounds and looks so good. I'm not sure it would last long around here either lol. YUM!!! This looks so delicious!! What a fun alternative to caramel apples! I love the flavor but not the stickiness so this is perfect! Your apple sheet cake sounds so delicious! Found you at Best of the Weekend. This looks/sounds heavenly! I love anything apple flavored in the fall and add in caramel, I'm totally sold. Yum! 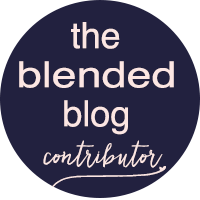 Your post is featured on Full Plate Thursday this week and we have pinned it to our features board. Thanks so much for sharing with us and hope you have a wonderful week!